The author has been involved in aviation publishing for more than 30 years and has been given special access to the BBMF at Coningsby. He is an active private pilot and has amassed an extensive photolibrary. This new book follows his first for Haynes, “Red Arrows in Camera” and is once again a unique photo essay. Many of the outstanding photographs were shot by the author, but there are also photographs from other sources, tracing the history of the RAF’s heritage flight. Where there is text and caption text, it is concise and necessary to support the images, rather than the images supporting the text. That should in no way diminish the words penned, but it should be seen as a combination of necessary words with a most powerful essay produced through the finest images. DESCRIPTION: The author has been involved in aviation publishing for more than 30 years and has been given special access to the BBMF at Coningsby. He is an active private pilot and has amassed an extensive photolibrary. This new book follows his first for Haynes, “Red Arrows in Camera” and is once again a unique photo essay. Many of the outstanding photographs were shot by the author, but there are also photographs from other sources, tracing the history of the RAF’s heritage flight. Where there is text and caption text, it is concise and necessary to support the images, rather than the images supporting the text. That should in no way diminish the words penned, but it should be seen as a combination of necessary words with a most powerful essay produced through the finest images. When the Second World War ended, Britain was financially exhausted and turned to its second National Socialist Government, this time under Atlee. Until the Soviet blockade of Berlin, the new Government had, as its primary international policy, a desire to cosy up to Stalin. As reality began to dawn, the only viable option was to cosy up to the US and the price for that was a rapid scramble out of Empire to allow the US to expand commercially and politically into what had been British areas of interest. Although Britain received the same financial help from the US that other European countries enjoyed, including the western occupied zones of Germany, the Atlee Government managed to waste this vital assistance through incompetence and a desire to re-engineer British society. Rationing continued long after other countries had returned to real peacetime economy and Britain was a very grey place of bombed sites, dated equipment, and roads that were still patched with temporary wartime repairs. In that environment, it is not surprising that heritage preservation was an alien concept. Wartime artefacts were destroyed by the million and little effort was made to ensure that future generations would understand the courage and self-sacrifice made around the world in the greatest conflict by Britons and British technical developments. The RAF was not singled out, the same monumental indifference, and occasional hatred, was also visited on the Army, the Royal Navy and anything that did not fit into the twisted National Socialist view of British history and achievement. Happily, many artefacts survived, almost by accident, and several historic aircraft were donated to the RAF from the British aviation industry in the form of aircraft, like the Hurricane and Spitfire, where examples had been used in development programs and corporate presentation. Even so, many of the most effective aircraft types designed and built in Britain to fight the war were lost, as had been the case after 1918. Some RAF aircraft became gate guardians, where airworthy aircraft rotted outside the gates of RAF stations, many having been gutted and mounted on supports to make them appear as though they were in-flight. The next happy accident was that private individuals became involved in aircraft preservation by operation, acquiring aircraft and spending large amounts of time and money in loving restorations. From North America an interest in flying displays of vintage warbirds, and racing former combat aircraft, spread to Europe. This saw the availability of restored aircraft begin to rapidly increase and the value of these assets to become significant. That prompted the British MoD to look again at how surplus and obsolete aircraft were disposed of, and to reconsider the method of providing gate guardians and aircraft for station fire dumps. The result was that many static aircraft were withdrawn as gate guards, some being replaced by GRP replicas, and consideration to keeping some examples in storage, pending restoration, and placing others on the market as private restoration subjects. When released POW, double amputee, Gp Capt Bader flew the lead aircraft in the Battle of Britain Day parade fly past over London in 1945, the RAF still had Spitfires, Hurricanes, and many other types of WWII aircraft, in front line service. In fact the economic failures of the Atlee Government ensured that some of these aircraft were later taken out of storage and returned to service because the Government could not afford to purchase the new jet combat aircraft from pioneering British companies and, in the process, ensured that Britain would lose its technology lead in jet aviation. From that first Battle of Britain fly past, the RAF saw benefit in making this a regular event and introducing fly pasts to mark other events, where a vintage warbird would be a welcome addition to the formation of modern aircraft. In much the same way, the display aircraft used at air shows and other events gradually developed into the Red Arrows formation display team that became the premier display team, recognized around the world, and arguably the finest display team in the world. It has not been an incident-free history. The Battle of Britain Memorial Flight and the Red Arrows periodically come to the attention of cost cutting politicians, but the public affection for these display teams has always managed to win the day. The public, more so than the politicians, have come to appreciate how important it is to recognize the sacrifices and service of past airmen and the continuing courage in modern conflicts. The BBMF and the Red Arrows are a powerful symbol of this and they also contribute an income as part of the tourist attraction of British heritage. It is difficult to value the tourist contribution, but some estimates rate the Red Arrows at achieving a 9 times return on the cost of equipment and operation, with the BBMF achieving a magnificent 23 times return. Claims of that nature may seem to some to be a wild guess that is far too high, but applying standard market valuation techniques actually achieves higher figures that may still be below the real contribution. The difficulty in valuing these two RAF teams is that they are most frequently part of an event, with the Red Arrows display often being close to the end of an event day. As a result, the market valuation typically divides the flying hours for the event day by the number of flight events, deducts the event costs from the day’s receipts, and then parcels the profit equally to the flight event contributors. That is a valid marketing valuation, but it makes no attempt to rank flight events on their ability to pull the crowds. It is not unusual for the crowd at an event to leave the static exhibits and trade stands to make certain that they are not going to miss a display by the BBMF and/or the Red Arrows, but not apply the same effort to watch other displays. Towards the end of the day, it is not unusual to see a mass exodus to the car park to queue to get back in the road, as soon as the BBMF and/or Red Arrows display has completed, even when another visiting national display team is following on with a very impressive display. Where the BBMF or the Red Arrows display is arranged to close the event, the exodus does not take place until after they have completed their display. This book is an equally powerful reminder of how much is owed and how much will be owed into the future. It traces the history of the BBMF and the very important part a small group of RAF service personnel play in ensuring that each year the BBMF is able to fly to events around the British Isles and maintain the ability to fly outside British airspace on other important occasions. It is relatively easy to think of the aircraft, but the major achievement is the high level of productivity produced by a relatively small engineering team to both keep the existing aircraft flying and to restore new additions to the Flight. A very few of the images used do not appear to be well lit, or may have suffered negative or positive film degradation over the years. However, these exceptions fully justify their inclusion because they provide unique images to expand the historic coverage. The overwhelming number of images is truly outstanding and provide a rare perspective. This is possible because the publisher has taken the greatest care in the production of this book. When first picked up it is surprisingly heavy for its thickness and size. The paper stock is first grade gloss paper and the binding is of a quality that was once common and is now rare. The second surprise is that the price has been kept to an RRP of £30.00, or US$45.00. It is all the more surprising that the printing and binding was carried out in the US rather than the current common practice of publishers outsourcing to China or other countries where low labour cost is combined with much lower quality paper stock. Taking the amount of care that has been lavished on this book by the creative and production teams has the immediate benefit that the images are superb. Even the handful of old monochrome images is sharp and well detailed. The invisible benefit is that this paper stock should survive for a very long time with only modest care. As a result, this book will become a heritage item in its own right. For many readers, the photographs of Spitfire and Hurricane in flight will more than justify the purchase but, in tracing the history, BBMF aircraft are shown in formation with other more modern aircraft. On page 17, there is a photograph in full colour of a formation, flown to celebrate the 20th Battle of Britain commemoration, that records the full achievement of British aviation manufacturers, using their own resources, skills and innovation. Flying in the lower left of the image, Hawker Hurricane IIc, LF363, is a late model Hurricane, but little different from the first Hurricanes to fly. The earliest Hurricanes had fabric wing covering that was replaced by metal, and they had a two-bladed fixed-pitch wooden propeller that was replaced by three-bladed variable pitch propeller. It was a hybrid, retaining the fabric covered frame and stringer construction that was little advanced over fighters of 1918 and recognisable as a very close relation to the RAF’s last biplane fighter the Hawker Fury that was still in first line service on the outbreak of WWII. The Hurricane was able to enter service quickly because it used dated construction, combined with a single wing, enclosed cockpit, radio telephone, and heavy armament of 8 rifle calibre machine guns. It was a very stable gun platform, destroyed more enemy aircraft in the Battle of Britain than did the Spitfire and, at the outbreak of war, out performed the German Bf 109. Above and to the right flies the Supermarine Spitfire PRXIX,PM631, which is also a later model than the fighters taking part in the opening stages of the Battle of Britain, but with a similar silhouette to the Spitfire I and Spitfire II. This was the outstanding fighter in May 1940, continued in production through WWII and continued on into the 1950s, the final versions having twice the engine power of the Mk II of 1940 and requiring a contra-rotating propeller to match the engine power with a reduced swept area that was within the ground clearance offered by the undercarriage. Above the Spitfire flies the Gloucester Meteor F8, WL164, that is a late model single seat first generation jet fighter that flew in combat during WWII, primarily as home defence against V1 flying bombs. In many respects, this aircraft was more capable than its German counterpart the Messerschmitt 262, using twin centrifugal jet engines that provided longer safe running than the German axial engines. Above the Meteor flies the Hawker Hunter FGA9, XE610/J, a superlative pilot’s fighter that was a great export success and the finest transonic jet fighter of its period. Above the Hunter flies the Gloucester Javelin FAW9R, XH894/R, which was the first RAF two seat all-weather and night fighter with advanced radar and a primary armament of four guided anti-aircraft missiles. This massive two-seat delta wing aircraft, with high mounted delta tail was an advanced system at the time of introduction, although the Sea Vixen. that lost out to the Javelin in the RAF procurement contest, provided much greater duty as a carrier aircraft in the Fleet Air Arm, where it was the first British fighter to be designed without a gun armament, depending on four guided missiles and two batteries of unguided missiles, also able to carry under-wing loads of refuelling ‘buddy’ tanks or bombs and rocket pods. The lead aircraft, flying above and right, is the amazing English Electric Lightning F1, XM137/F, which was the first supersonic RAF fighter capable of twice the speed of sound. Considering its design genesis in WWII, this was a most extraordinary combat aircraft with a spectacular rate of climb and a principle armament of two air-to-air guided missiles, marking the high point of all-British military aircraft design and manufacture. In one photograph the complete monoplane fighter history of all-British aircraft from 1935. Throughout the book, the BBMF aircraft are seen on their own, in formation, and in formation with other aircraft from the RAF and other airforces, through the history of the BBMF, including a Concorde SST and a Royal Canadian Air Force Lockheed Starfighter. As mentioned above, the Hurricane was a hybrid and this is shown very clearly in one of the unique restoration images, where PZ865 is completing major restoration work with the application of fabric covering to the fuselage and the doping process so familiar with the very first biplane aircraft at the dawn of aviation. Originally, the RAF intention was to attempt to maintain at least one flying Spitfire and hopefully to have a Hurricane in flying condition at the same time. Circumstances allowed a much more significant Flight. Today, six Spitfires, two Hurricanes, a Lancaster bomber, and a Dakota are immaculately maintained in flying condition and are accompanied by two Chipmunk trainers that provide tailwheel low wing monoplane propeller experience in an age when the nose wheel undercarriage is almost universal. The Battle of Britain film was shot during 1969 and brought the BBMF aircraft together with a spectacular collection of Hurricanes, Spitfires, Spanish versions of the Bf 109 and the Heinkel 111. To augment the real aircraft, a large number of full-size non-flying replicas were also built. It marked the point where many could see that other WWII combat aircraft could be restored and maintained in flying condition. It produced an expanding industry to support the major restoration of vintage aircraft around the world. Today there is a network of enthusiasts and manufacturers who have the capability to restore an apparent total wreck to full flying condition. The skills and technology have now reached the point where a single original component of an aircraft like the Spitfire could fly again as part of what would otherwise be a faithful flying replica. Where the BBMF, and once the remaining in-service Shackleton AEW squadron, had to search museums in the hope of trading a life expired component for a similar part, from a static display aircraft, that still had remaining life, BBMF engineers are now capable of manufacturing spares where there is not yet a manufacturer regularly producing replacement parts. It is therefore entirely possible that the BBMF could still be flying a group of WWII vintage warbirds for another hundred years or more, and possibly be expanding the number of aircraft in the Flight by adding new restorations. 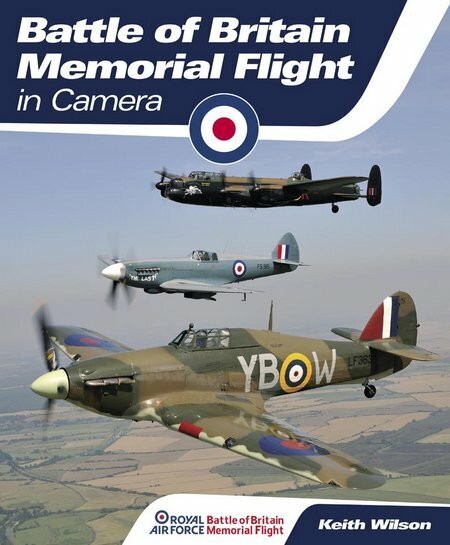 The author has included an excellent collection of photographs from the restoration of the latest addition to the BBMF. Spitfire Mk XVIs, TE311, was built in 1945 and ended up on the BBMF inventory as a source of spares in 2001. Permission was given to restore the fuselage as a ‘spare’ and then a decision was taken to carryout a complete restoration to flying condition, flying again in 2012. This fantastic collection of images also provokes thought. To keep the enlarged Flight operational is a huge achievement. Alongside this, private collectors and museums have produced similar huge achievements in keeping one or two aircraft flying after years of painstaking restoration, or even building an air force with dozens of vintage aircraft flying together in major war bird air shows. Even though there are still enormous challenges in finding or making the spares to keep the aircraft flying, the enormous growth of aircraft preserved by operation is now making it possible to achieve restorations and replica building that only a very short time ago would have been an impossible dream. The author has therefore raised two very important questions by implication. Should the BBMF continue to be funded by the public purse and staffed by serving RAF pilots and engineers, or should the large private sector take responsibility? This question is now more pertinent because a private group of volunteers has managed to restore and fly a Vulcan bomber which some will argue should have been done by the RAF as part of the BBMF or as a new heritage flight that includes the BBMF. The second question is – should the RAF, or a volunteer group replacing the BBMF, undertake a planned program to produce a selection of aircraft from 1918 that have marked key points in the British aviation industry’s history, and RAF service, to include examples up to those aircraft in active front line service? Here are certainly aircraft in museums that could be viable major restoration projects from WWI to the present day. As many of these aircraft include technology and even parts in current use for the BBMF aircraft, this is not as wild an idea as some may believe. What it requires is the will and continuity to manage a project that will stretch over several years. There is also a very strong reason for Britain to think of ways in which its remarkable technical innovation can be show-cased to help build new markets for British goods and services. To be able to show how British aviation has developed in only a lifetime from frail wood and canvas kites with primitive engines, to the most advanced combat aircraft and spacecraft, would present a compelling reason to buy British and for new generations to understand just how much has been achieved by British courage and ingenuity. A reviewer always wishes an author and publisher every success with any book that is the product of thorough research, inspired selection of images, and high quality production, as a reward for their creativity and effort. In the case of this book, this reviewer offers those wishes, but also commends the work to a very wide readership. In particular, it is hoped that some of our weak and venial politicians will buy copies and be blown away by the impressive demonstration of British achievement, building an understanding of why the peace dividend never exists to be spent, and fully appreciating the bravery and determination demonstrated by British warfighters when they are casually committed to great danger, deployed without adequate equipment and resources, but expected to make politicians look good when they strut the world stage.